Istanbul Boat Cruise on both Golden Horn and Bosphorus +City Bus Sightseeing Tour This tour is recommended for families with children. 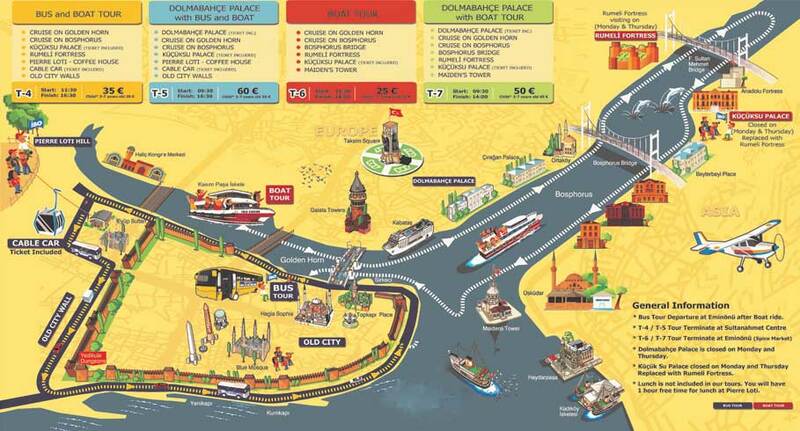 Istanbul City Sightseeing Bus and Boat Combo Tour; See the sights of Istanbul by sea and by land on a 5-hour sightseeing cruise and trip to Pierre Loti Hill. This is an exciting way to discover the wonders of Istanbul. You will cruise by common tourist sites such as Galata Tower, Dolmabahce Palace, Bosphorus Bridge, Rumeli Fortress, Maiden’s Tower…much more. After the boat cruise, now it is time to explore the city on the land; we first go around the historical city walls around the all town, then visit Pierre Loti Hill, take the cable car, enjoy the beautiful view from the cable car all the way down to the hill. A relaxing cruise in which you will be able to see the sights of the Bosphorus Bridge, Galata Tower, Dolmabahce Palace and Rumeli Fortress (Rumeli Hisari) from Bosphorus.